The Firefly-class ship is a multipurpose, mid-bulk transport boat designed by Allied Spacecraft Corporation. From when the first series one hit the market in Feb 2435 to the latest series four model in July 2513 they represent one of the most versatile and readily available ship in the verse. Reaver starships are abominations: older-line models for the most part, often no longer used by other inhabitants of the verse. They are festooned with bits of random debris and ghoulish junk, a characteristic paint scheme of red slashes, and the skeletons of their prey, and are frequently armed with a magnetic grappler with which to seize victim ships. 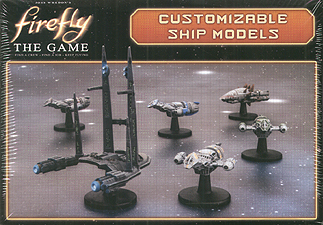 This box contains a full set of the models from the basic game that have been re-mastered and produced in high detail resin so that you can customise your own ships and give them your unique paint schemes.